1 image. "Buy Christmas seals", 14 November 1953. Sammy Valdez -- 3 years (polio patient). Supplementary material reads: "George Hart, Santa Ana. Cap. 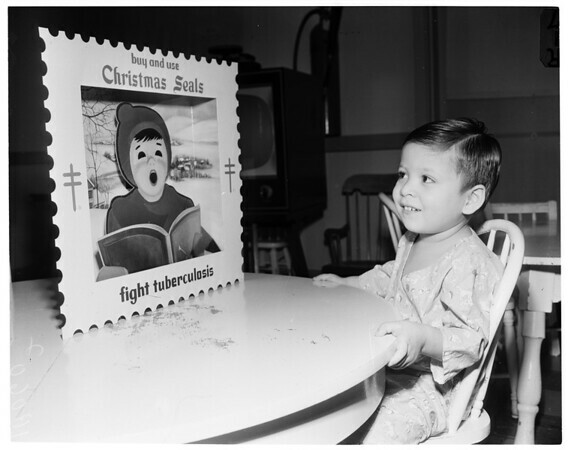 Tiny TB victim -- 'Buy Christmas Seals' is the plea of small Sammy Valdez, 3, a polio patient in Orange County General Hospital. Sammy is one of many Orange County children making a long fight back to health. His disease was detected in its early stages by the X-Ray unit of the Orange County Tuberculosis and Health Association, thus preventing a more severe attack, physicians said."